The benefits of Aikido are many, and can last a lifetime. As a path of self-development, Aikido leads towards the integration of mind, body, and spirit – towards making us complete human beings, which not only benefits us, but benefits the people around us. Physically and psychologically, Aikido is at the same time very complex and yet very simple. The changes it can make in our lives begin at the surface and go as deep as we let it. Specifically, physical benefits of Aikido practice include increased balance, coordination, reaction, and sense of timing; improved posture, flexibility and aerobic conditioning; a greater awareness of our bodies and how we express ourselves through our bodies; and a more relaxed and confident presence. Mental benefits include this increased self-awareness and relaxation; better ability to resolve conflicts and deal with stressful situations in a calmer and more positive manner; greater self-confidence and self-discipline; and the constant challenge of self-development and learning new skills. Spiritual benefits include being able to improve one’s own quality of living; to break or change old habits and conditioning; to see things with greater clarity and perceptiveness; and to have a greater intuitive understanding of ourselves and the world around us. Aikido is well-suited for self-defense. Aikido techniques are done against a variety of attacks – kicks, punches, strikes, chops, grabs by one or both hands to wrists, elbows, shoulders (from front or back), combination attacks, some knife or gun attacks, and attacks by more than one person. Because it trains not only the body, but the mind and spirit as well, it is a holistic approach to defense and self-protection. Aikido training develops one’s energy and expression of energy and enables the practitioner to maintain a calm state of mind under adverse conditions. On one level, with increased awareness and self-confidence and better posture and movement, you will be able to avoid potential situations. On another level, if someone does attack you, your training will enable you to react in a way the attacker may not expect, which may diffuse the attack by itself. Yet on another level, if you are in a situation where you do have to do something, Aikido teaches you basic, effective body movement, techniques, escapes, and immobilizations that you can use to protect yourself in many situations. The New Delhi Aikido Dojo was opened in November 2004 by Sensei Paritos Kar, a 4th Dan Black Belt from Aikikai Hombu Dojo Tokyo, who returned to India after living for 15 years of in Japan. Sensei Paritos Kar is one of the few martial art instructors in India to have the courage to start teaching aikido professionally. 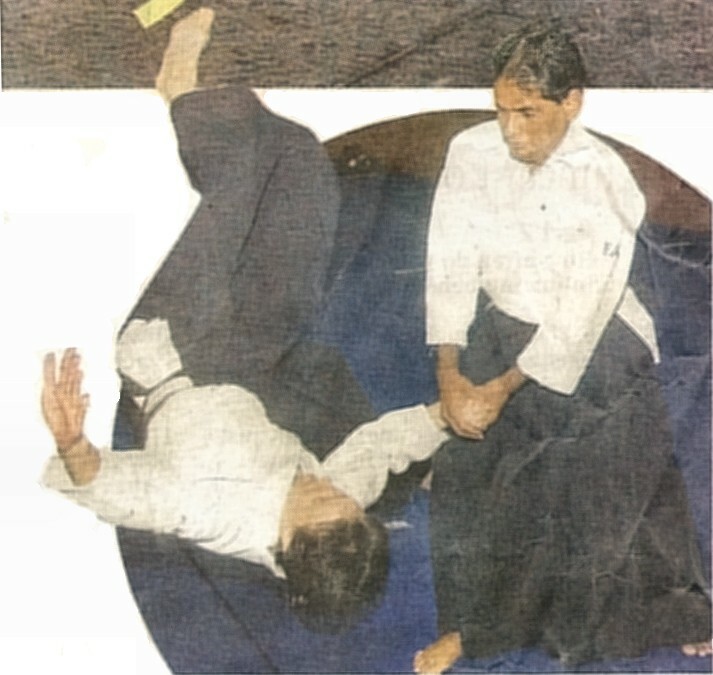 To come to Delhi to open an aikido dojo was undoubtedly a big decision for him to make: aikido is almost unheard of in India and it is considered to be a non-competitive “sport” and so it does not interest schools. Moreover, it requires mats and a dedicated space. However, Sensei Kar’s sincerity and dedication helped him to overcome the initial difficulties and attracted like-minded people to help him in his mission. During the two years of the dojo’s existence, the active membership has grown stronger: as of now, there are about 30 adults, Indians and foreigners, men and women, all training cooperatively. Many current dojo members have a martial arts background. However it is often said that once you start practicing aikido, it is practically impossible to go back to other martial arts because aikido is so different in its approach. The uniqueness of aikido lies it its spiritual philosophy which was taught by the founder, O-Sensei Morihei Ueshiba and encompasses an attitude of peace and love for all living beings and a oneness with nature and the cosmos. As peace and love have no enemies, an aikido practitioner has no enemies, no opponents to fight. Any aggressive force directed at an aikido practitioner is redirected and effectively neutralized without doing harm to the attacker. The aikidoka’s response is fast, the technique is invisible and it utilizes the aggressor’s own energy and turns it against him. This normally is enough to stop the aggressor in his tracks and to prevent an escalation of the conflict. Aikido training is not soft or easy by any means. In fact, it is considered one of the most technically difficult and even “esoteric” martial arts. However, the good news is that there are no age limits in aikido. In the Hombu Dojo (The World Aikido Headquarters), Tokyo, I saw many senior people, some in their seventies and even eighties, practicing aikido on a regular basis. There was an elderly man who had knee replacement surgery who was a regular in the early morning class, always with a small foldable stool to help him to do the sitting techniques. The age factor is not a problem in aikido. On the contrary, with many years of practice the techniques become awesomely powerful and imperceptible. The practitioner does not rely on muscle strength but invisibly blends and utilizes the energy of his or her partner/opponent. I have never met a person who claimed that they had perfected their aikido. The aiki spirit is ever elusive and the search for perfection lasts a life time. It becomes a way of life for many practitioners. In our dojo we have regular visitors from abroad. This is another tradition: an aikidoka while traveling prefers to carry his keiko-gi (practice uniform) and a hakama (black traditional samurai pants) with him – just in case there is an opportunity to practice. Aikido practitioners from different counties are welcome to practice in our dojo. Through them we get exposure to different styles and, indirectly, to the teaching of various great aikido masters. In 2006 the dojo was fortunate to hold 3 seminars conducted by distinguished aikido masters: Shihan Gaku Homma Sensei, the founder and chief instructor of the Nippon Kan, Denver, USA, Shihan Terry Ezra Sensei, the founder and chief instructor of Komyokan Aikido, UK, and K. Sakurai Sensei, 6th dan from the Aikikai Hombu Dojo. Not only did these senseis came and stayed in New Delhi at their own expense, they also taught the students for free. Their mastery of the art combined with their goodwill has helped to boost the nascent art of aikido in India and give tremendous encouragement and experience to our pioneering aikido students. It is evident that after the two years of hard work and sacrifice on the part of Sensei Paritos Kar, the New Delhi Aikido Dojo has finally established itself and is poised for new growth. We hope that the year 2007 will be rich in aikido experiences and events and that the dojo will attract more dedicated, talented Indian students capable of becoming aikido instructors. A martial art similar to Kung Fu called Aikido is gaining popularity in India. In spite of there being just a single instructor in the whole country, Aikido has definitely made a small beginning in the Capital. A narrow corridor leads you to the Aikido centre in New Delhi. A small but dedicated lot of aikido students meditate just before starting the day’s practice. This Aikido centre was started about a year back by Sensei Paritos Kar and is the only one of its kind in India. “Aikido is a self defence martial art but the difference between Aikido and other martial arts is the way to harmony. “Aikido is not only physical but it’s also a physio, psycho and spiritual martial art. So in the physical aspect, it helps very much,” said Paritos Kar, Aikido instructor. Aikido promotes a hands-on approach to healing. It energises the joints, improves circulation and even coordinates breathing. Paritos Kar, a fourth dan black belt has been practicing Aikido for 15 years in Japan. What’s striking about this art is that there are no competitions. It simply encourages a person to follow his own path of Aikido. “A proper exercise is something that exercises you completely and not just physically. It’s also an exercise where you’re emotionally and spiritually involved because what you are doing is not just normal moves,” said Manisha Mathur, an Aikido student. In a bid to popularise the art form in India, the Aikido foundation hopes to bring in some more instructors and even introduce it in schools. Aikido may be in its nascent stage but with the growing awareness of alternative sport and sophisticated fight sequences in Bollywood, it may soon become extremely popular with the common man. The Aikido centre in New Delhi, which was started about a year ago by Sensei Paritos Kar, is the only one of its kind in India. The art involves no punches, no kicks but simply involves the dynamics of movement. “Aikido is a self-defensive martial art. But the difference between Aikido and other martial arts is [that it is] the way to harmony. It is not only physical but it’s also a physiological, psychological and spiritual martial art. In the physical aspect, it helps very much,” said Paritos Kar, the Aikido instructor. Kar, a 4th dan black belt, has been practicing Aikido for the past 15 years in Japan. The sport promotes a hands-on approach to healing. It energizes the joints, improves circulation and even coordinates breathing. “A proper exercise is something that exercises you completely not just physically. It is also an exercise where you are emotionally and spiritually involved because what you are doing is not just normal moves,” said Manisha Mathur, an Aikido student. Perhaps one of the most striking things about this martial art is that there are no competitions. It simply encourages a person to follow his own path of Aikido. “I’m also a physician and I can tell you that Aikido has tremendous health aspects and its warm up exercises, the stretching, the flexibility and learning to blend with other people’s energies, works well both at home and the workplace and the real world,” said Dr Ken Dekleva, an Aikido student. Aikido includes sword and staff techniques and also open hand skills. In a bid to popularize this martial art form in India, the Aikido Foundation of India hopes to bring in some more instructors and even introduce it in schools. Although the idea of a martial art as striving for peace and harmony may seem like an oxymoron, it definitely is the basic essence of this art form. Aikido may be in its nascent stages but with the growing awareness of alternative sport and sophisticated fight sequences in Bollywood, it may soon become extremely popular with the common masses. Martial arts enthusiasts are in for a treat this weekend in Delhi with the visit of an American grandmaster. Shihan Gaku Homma Sensei, a student of Morihei Ueshiba the founder of Aikido will hold a seminar and public demonstration of this spiritual martial art based on harmony (ai), spirit (ki) and finding ones way in life (do). Adapted from the more violent fighting art jujutsu, this gentle martial art combines circular movements, breathing and meditation which increase a person’s energy, fitness and peace of mind. It can also prove very effective for self defence. Rather than meet an attacker head on, aikido practitioners use circular movements to avoid an attack and use their opponents own force against them. “You don’t have to be strong and you certainly don’t have to be aggressive to do Aikido,” said Delhi’s only Aikido master Paritos Kar, who trained in Japan for more than 15 years. The lessons students learn about neutralising aggression can help to bring harmony to everyday life, he added, explaining that the spiritual aspects of the art have to be practiced to be properly understood. Shihan Gaku Homma Sensei who hails from the Rocky Mountains is known for his spiritual approach to martial arts. He also has a unique teaching method which combines kenjutsu (sword) and jojutsu (staff) and taijitsu (open hand).